Ken Bailey - creator of The Mighty EnergyGirl and winner of my Birthday Fan Art contest last year - requested that I draw my characters playing with model trains. Belt Boy's gone overboard... or rather, "off the tracks". This one was hard to figure out, partly because I wanted the joke to have a good delivery, and partly because I was considering using a character I have yet to reveal in my comic...! 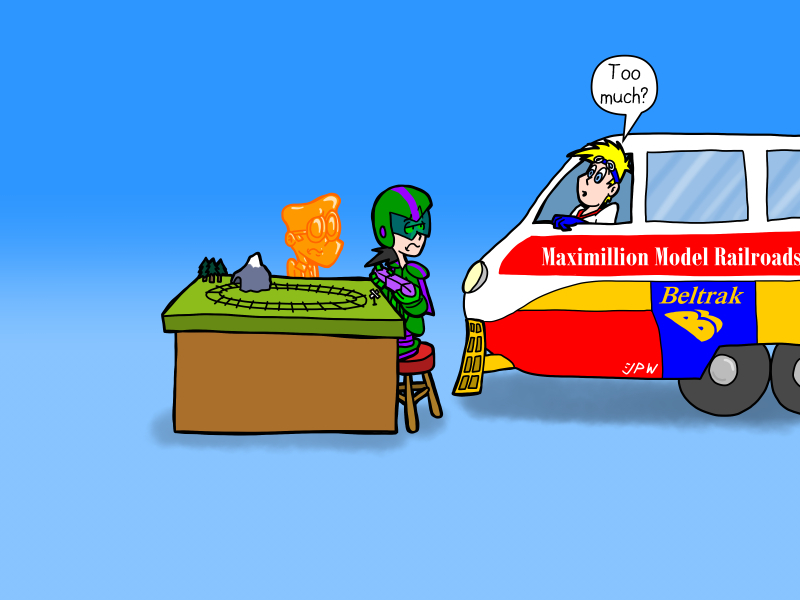 One gag I had planned involved Titanium Maiden schlepping a giant remote control for Belt Boy's giant model train, but then I remembered that most model trains I've seen have control panels; it's CARS that have remotes. Gelatin Boy and Cannon struck me as the two cast members most likely to play with model trains; GB's the kind of geek who would have fun, nerdy hobbies, while it's been established that Cannon was fascinated by Belt Boy's gadgets from a young age. If you like this picture, you can make it your own desktop wallpaper! Just go to my main page and click on the Downloadables button to see all the wallpapers I have available! Hmm... this reminds me... isn't it time for THIS year's fan art contest to start soon...?